Vetalwadi fort or Vasai fort (not to be confused with Vasai fort in Thane district) is situated in Aurangabad district near Soygaon taluka. Its solid and huge fortification, bastions and buildings are still in a good condition, which easily grab trekkers� attention and gives a feel of a complete fort. If we are travelling from Mumbai or distant place, it is convenient to cover the nearby forts Janjala, Sutonda, Bhanshigad, Lahugad, Vetalgad and Rudreshwar caves along with the same. From Undangaon diversion on Sillod � Jalgaon road, the Halada Ghat directly takes us to the entrance of the Vetalwadi fort. This entrance welcomes us with the 2 huge bastions with another huge bastion behind it, which are constructed to attack the enemy entering. It also has decorative balustrade. The paved route between these 2 bastions turns in right angle and goes to the north facing entrance door. This door is said to be also called as Janjala Darwaja as it faces the Janjala fort. The bastion�s height is around 20ft and it has 2 Sharabh sculptures on it. There are also has porches for guards. There is a staircase which routes to the square shaped opening on the roof of main door. The stairs from this opening take us to another chamber. From this top point, we can see the fort walls, Halada Ghat & the Vetalwadi Dam below. On the upper side we can see the fortification of the citadel. Down the entrance door, on the right side is a dry cistern with pillars. The trail to the right from entrance takes to another big bastion, which is a host for bats today. After walking some distance we reach to the east facing bastion. Further 5 minute walk takes us to the citadel of the fort. Near this bastion of the citadel, there is a small dome shaped building which has small opening in the roof through which we can reach the middle bastion. There is a cistern near this bastion called �Tel-Tupache Taake� literally meaning the cistern for oil / ghee. Besides this oil tank we can see a granary, in front of which there are remains of a building. Ahead there is a mosque named �Namajgir�, on the walls of which we can see the carved signature of Nizam and a cross below it. In front of Namajgir there is a pond and to the right is a tomb. To the northern point of the fort there is a building named �Bardari� which has 2 distinct arches. On the way to Bardari, there are some remnants. In Bardari we can find 2 rows of arches. It is said to be built for the royal family to spend leisure time. There is a similar mansion on the Deogiri fort too. Below the Bardari we can see the main entrance and Vetalwadi village. We can reach the main entrance or the north facing entrance by a trail from Bardari. On the way, we can see a canon of about 6�10� in length. There is a secret door in the fortification. This entrance is guarded by two bastions and one of its doors faces north. Height of the door frame is about 20 feet and there are two Sharabhs carved on two sides. There are porches for the guards inside and the second door faces west. From this, it takes almost 20mins to reach to the Vetalwadi village. The Rudreshwar Caves are ancient caves located 2-3 km east of Vetalwadi. It takes 45 minutes to hike to the caves from Vetalwadi. The caves exhibit Brahmin type sculptures, and we can find the sculptures of Lord Narsinga, Ganesh, Bhairav and Saptmatruka along Shiv linga and Nandi. Sillod town is situated 65 kms away from Aurangabad on the Aurangabad-Jalgaon road. Diversion to Undangaon is 14 kms north of Sillod. From here, the distance to the Undangaon is 5kms and Halda village is about 12kms away. 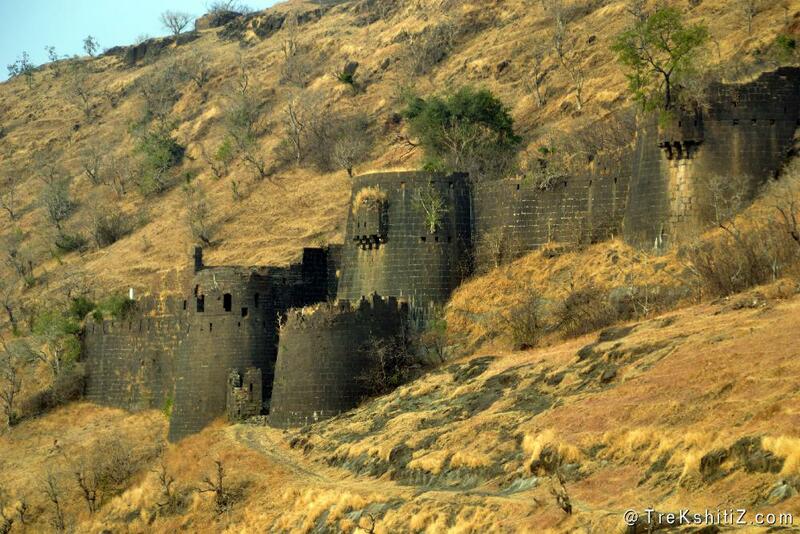 Halda pass starts from here and Vetalwadi fort is situated at a distance of 3kms. We land right in front of southern entrance of the fort. Phardapur is located on Aurangabad-Jalgaon highway, about 105 kms away from Aurangabad. Soygaon is located 15 km west of Phardapur, and Vetalwadi is 4 km south of Soygaon. It takes 45mins to climb the fort from the Vetalwadi village. If we are travelling by the public transport, we can take Aurangabad � Soygaon ST bus. From Soygaon, we can reach Vetalwadi by a 6 seat auto or bus. It takes 45 minutes to climb the fort from the Vetalwadi village. The route starting from Halada ghat takes 10 minutes to climb the fort.